Bollington – the small town with the village atmosphere at its heart, it is often referred to as a Lancashire mill town in the Derbyshire hills of Cheshire – the Happy Valley. Situated on the very edge of the Peak District National Park, Bollington is a traditional stone built mill town, the only stone built community in Cheshire, nestling in the valleys on the sides of green hills which look away over the Cheshire plain. Narrow streets lead through the town providing tantalising views of hills, valleys and the very quarries from which the building stone was hewn by the sweat of its early inhabitants. Many of their descendants live here to this day – once a Bollingtonian always a Bollingtonian! The great variety of community activities include theatre, music, choral, many sports, scouts & guides, special interest groups for young and old, and the Bridgend Centre . Possibly named after Bolla’s ton or village in a medieval era of primitive farming, the town has evolved through the birth of the industrial revolution with the first water powered mills in the district, in Ingersley Vale, and later the giant Clarence, Adelphi, Waterhouse, Oak Bank and Lowerhouse steam powered mills fully supported by the then revolutionary canal and railway. In modern times some mills have disappeared, others have changed their industries – Adelphi is full of high tech businesses – and the top floors of Clarence have been converted into apartments with industry and comerce below. And at Clarence find, too, the Civic Society’s Discovery Centre where this story is told. Those two man-made transport routes, now redundant from their original purpose, serve the town as very popular recreation and nature areas – the Macclesfield Canal , navigated today by increasing numbers of narrow boats and cruisers, it’s busy towpath used by walkers, runners and fishermen, and the Middlewood Way, once the Macclesfield Bollington & Marple Railway, now the green home to a great variety of flora and fauna. But for all the changes wrought over the years Bollington remains a friendly little town, bustling by day and night – many glorious pubs and restaurants – retaining its scale, keen to avoid the extremes of out of character development, keeping its community together, committed to a comfortable relationship with each other, the hills and the town. 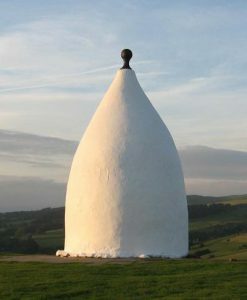 And all this overlooked by that potent symbol of our community, White Nancy.